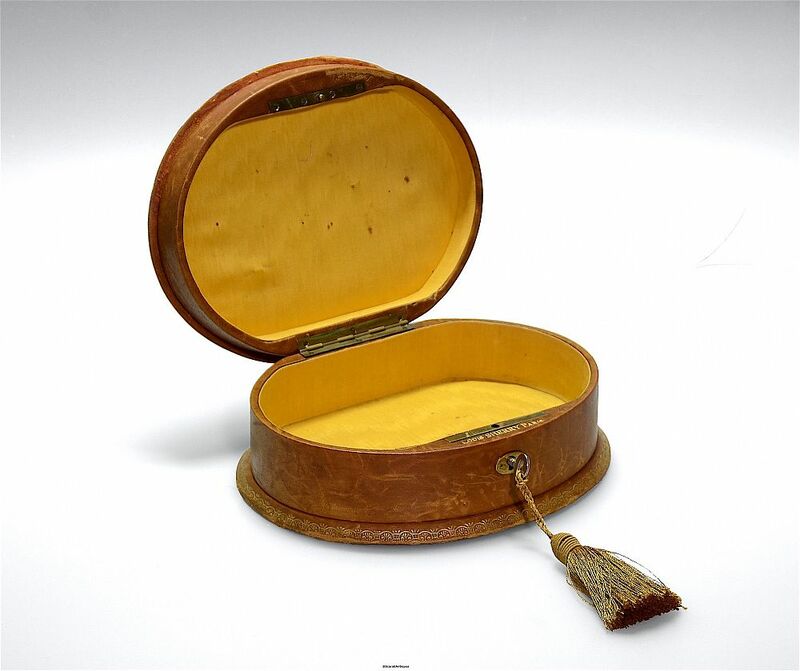 This lovely oval brown gilt embossed leather box has an oval silvered metal plaque inset into the top. 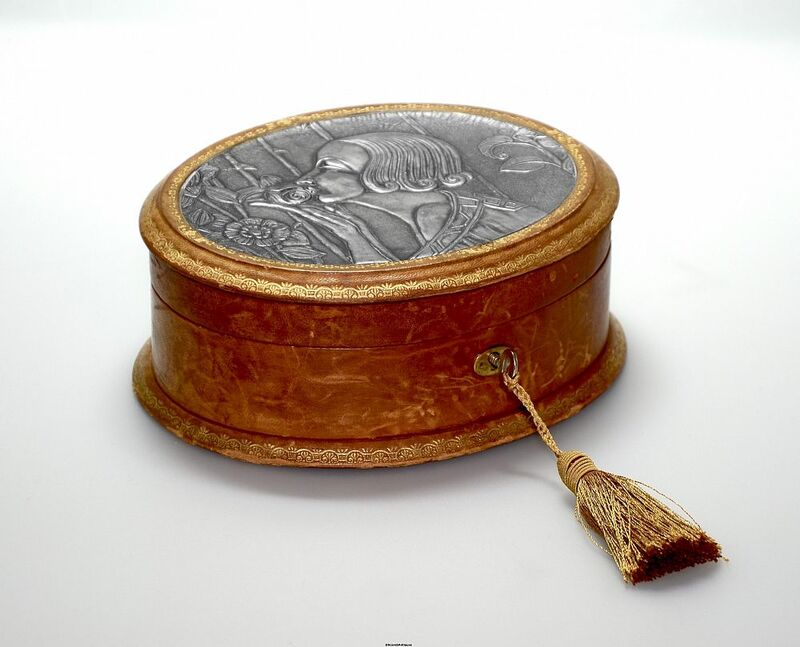 The plaque depicts a woman looking left and sniffing a rose that she holds in her hand - the image is almost identical to that on the embossed chocolate box that is also on the site. The inside of the box is stamped "Louis Sherry Paris" in gilt and has its own key with an associated bronze silk tassel. The interior is lined with gold silk like material. It has small round domed brass feet. Accompanied by a framed original advertisement for le Figaro for 1926. I believe that this was a chocolate box as Louis Sherry, in addition to being a famous American restauranteur, also made chocolates. As the box is stamped "Louis Sherry Paris" it would not be unreasonable to assume that the box was made in France. The information that I have seen does not refer to Sherry having an outlet in Paris. 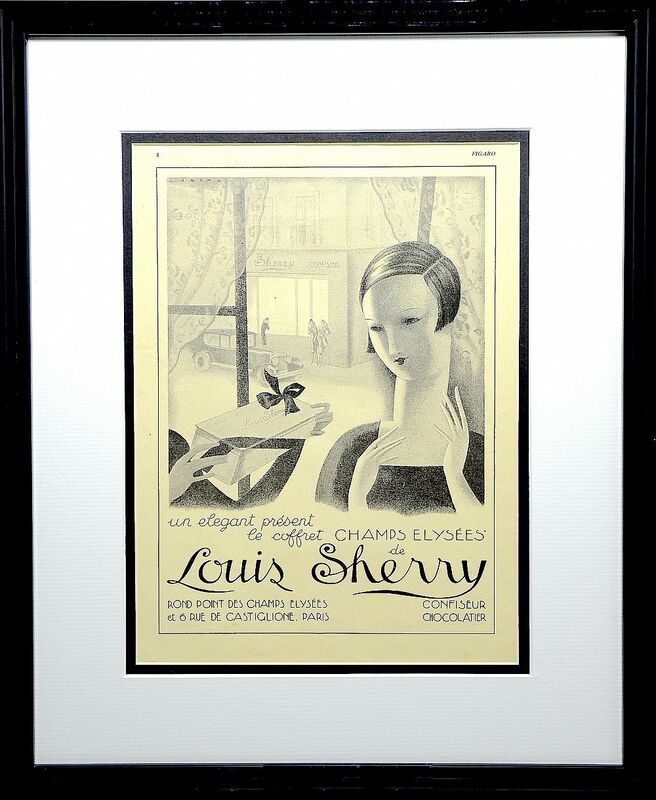 However the accompanying framed original Louis Sherry advertisement from the French newspaper, le Figaro gives 2 addresses, one in the Champs Elysees and another on the Rue de Castiglione. There is a picture on the current Louis Sherry website of his 1881 New York shop the facade of which states "Louis Sherry New York Paris". I have seen images of numerous vintage Louis Sherry tins that state 'Louis Sherry New York Paris". All in all I think that it is safe to assume that Sherry had an outlet of some sort in Paris and this is a chocolate box that was sold in Paris. American restauranteur, caterer confectioner & hotelier particulary associated with upmarket chocloates & ice cream. First known in the restaurant business at the Hotel Brunswick and then as restaurant manager at the Hotel Elberon. In 1880 he launched his first restaurant at 38th Street & Sixth Avenue in New York City and soon acquired a Society following. He moved to 27th Street and Fifth Avenue and then to larger premises at 44th Street and Fifth Avenue. He closed his restaurant in 1919 and established Louis Sherry Inc., to concentrate on catering and production and sale of chocolates and pastries opening a new shop at 58th Street and Fifth Avenue forming an alliance with the Waldorf-Astoria Hotel. At some stage Lucius Boomer & Coleman du Pont of Boomer-duPont acquired a significant interest in Louis Sherry Inc.